With the current festivities under way, the 'shop has been locked up for a few days, but there's been a little done on this current project. Firstly, the drawer dust boards have been made, oak and oak veneered ply with a walnut lipping. Very odd, but why? The answer lies here.... but you still don't know what the little hole is for! All will be revealed later, which means that unless you can guess the answer, you're going to have to grit your teeth and resolve to make a binding New Year's resolution to keep on reading this drivel. Finally, a shot of the double Krenovian style door latches. I made them 15mm deep as I inserted 10mm oak filler plug into each on as mdf isn't the best thing to hold a screw...and besides, if the latches were ever removed, the sight of some nasty mdf is going to cause someone to wrinkle their noses and exclaim...."eweeeeee....why did he have to use that stuff?" 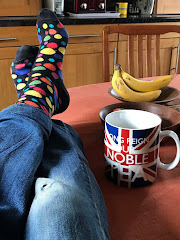 So here we are, the end of yet another calamitous year on the 'Blokeblog', with no doubt many more calamities to come in the following year. Wherever on this small Earth of ours that you happen to be reading this, I hope you've had a most excellent Christmas and I wish you and yours a peaceful and prosperous New Year. Slick. That is just simple.